A sundowner before dinner. A cheeky cocktail overlooking the sea. A little nibble after a day on the beach. Remember those evenings on your holidays sipping a cocktail listening to the waves and watching the sun go down...that's what we've created here at The Beach Hut. 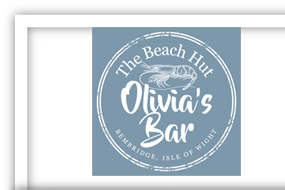 Join us at Olivias Bar. A Tikki style bar open on sunny Friday evenings during the summer months on dry evenings. Let Jon create you a cocktail. Bring a few chums. Sit and enjoy the view. When the café closes at 5pm, Olivias bar up on the terrace will open until 8pm. This area is also available for private hire where we supply nibbles, drinks and waitress service. To check if we are open call us on 01983 874270.